A friend of mine posted this on her FB page last night. She received her book! They’re making their way into the world, and I’m in two minds about that. 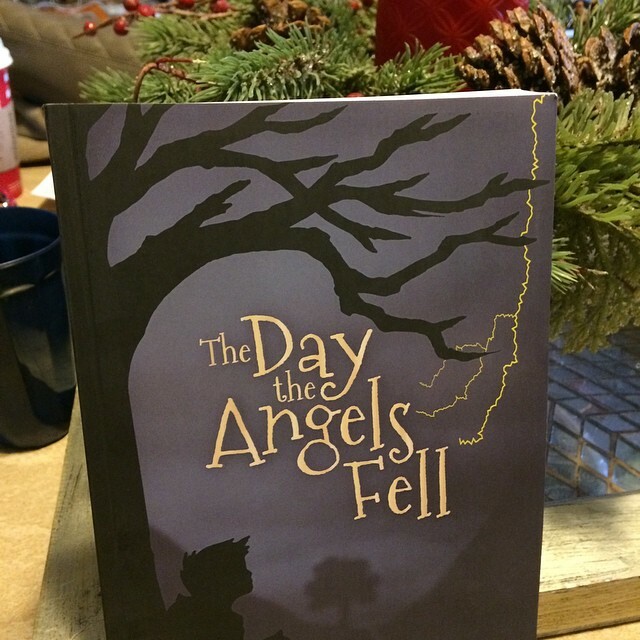 I spent over two hours in the post office on Friday mailing nearly 200 copies of The Day the Angels Fell to six different countries. At first the lady at the post office wasn’t too sure what to think of me, but by the end of it we were chatting amicably and when I found out she liked to read, I gave her a copy. You can always tell a reader by the way they receive the gift of a book. Two hours is a long time to stand there watching someone scan and rescan and rescan barcodes and stamp stamp stamp and type type type. It was one of those times when the voices started up again in my head. Those good old voices. Kickstarter was a great idea, wasn’t it? the first voice asked. I mean, now instead of making a fool of yourself in front of your family and friends, you’re doing it in front of a few hundred people! Also, another voice chimes in, now that you’ve already started scheduling a book tour, that will work out perfectly once all those 1-star reviews start coming in. How fun will that be, touring with a book that everyone hates! These guys don’t pull any punches. They know how to hit you where it hurts. After listening to Anne Lamott the other week, I realized that one of the things I love most about her is that she’s reached a stage in life where she seems not to care what other people think about her, and she doesn’t try to control others. Wow. Those are two things I would love to be able to say. I don’t care what other people think about me. I refuse to try to control other people through judgment or manipulation. I feel lighter, just thinking about living that way. So as those yellow envelopes got barcoded and stamped and sent to Australia, Canada, Germany, the Netherlands, England, and the US, I decided that I was going to celebrate the moment. I sent out 200 books to people who wanted to read them! That’s pretty cool. On the way home I stopped at the Fractured Prune for a dozen Mocha Buzz donuts, and when I got home they were still warm and Maile, my kids and I had a little celebratory snack, both because I had escaped the purgatory that is the USPS on a Friday just before Christmas and also because The Day the Angels Fell is making its way into the world. I don’t think we celebrate our creative endeavors enough. I know I don’t. We can’t let our fear of failure keep us from creating. We can’t let an overdeveloped need-for-acceptance stunt our development as creative people, because this thing has to be created in order for that next thing to be created in order for that finally-beautiful thing to be created. Start now and don’t look around. Put on the blinders. Move forward. For any of you who receive your copy this week, post a photo of you with the book on Instagram or Facebook and tag me (@shawnsmucker on Instagram or Shawn Smucker, Writer on Facebook), and you’ll be entered to win a free copy of the book. On Friday I’ll draw five winners and mail a copy to one person of your choosing (which could be you if you want a second copy). Four days until the launch! The voices are trying to be helpful. They think they are protecting you. It’s can be a useful idea to build relationship with those voices. I call them parts. We have many parts of our selves. Building relationship with those parts allows us to not be dictated by them but understand them – in this case, understand their concerns. They are alarms. But the part of you that can observe them and listen to them is your greater self. Finding our way to our greater self is powerful in that we do not have to feel that we are only the part of us that is reacting. A shift can often occur in how you feel and experience those parts that tend to send negative messages. You can welcome their input, create space for them to exist, appreciate their concern for your well being. But assure them this situation isn’t huge danger. They can become tamer and more useful to you once they are fully acknowledged and allowed space in your experiences. This is all a way of giving ourselves a bit of distance from our emotional reactions. They do not have to be all that we see. But if we do not build relationship and fall into their one view perspective, that’s when we get really lost in all that self doubt and flagellation and despair. Anyway. Cheers to sending 200 books to people in different countries who want to read them because they like your writing. That’s cool. I feel like that’s something this process is helping me to do, though I wouldn’t have been able to articulate it. I received your book in the mail and can’t wait to read it. So excited for you and you’re family.